Today, scientists use cameras mounted on powerful telescopes to take pictures of the sun's surface magnified hundreds of times, revealing detail that scientists of Galileo's time would have found wonderful. But scientists are still trying to find even better ways to study the sun, equipping telescopes with various filters that capture nonvisible parts of the sun's emission, such as x-rays and magnetic fields. This section will look at how these new methods for examining the sun are changing our understanding of sunspots. 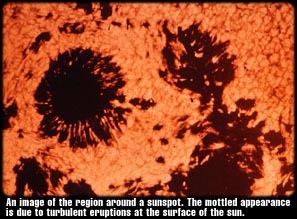 In addition, this section will explore the sunspot cycle, and the known and possible effects sunspots have on earth. The modern development of the telescope has greatly extended what astronomers can see. According to David Dearborn, who is a stellar physicist at Lawrence Livermore Laboratories when he's not studying archeoastronomy in Peru,"The scientists in Galileo's time had instruments with less resolution, less ability to see detail. They could see clearly that there were dark regions on the sun, but they couldn't see any of the fine structure. Telescopes today operate in different wavelengths, so the fellows in Galileo's time had to just use the eye, and just use visible light. Today, people are using instruments to measure the light more precisely than the eye can, and measure it in colors beyond the visible, extending to ultraviolet, infrared, and even x-rays and gamma rays." Viewing the nonvisible light that the sun emits not only gives scientists new ways to examine the sun but new ways to contrast and compare results. With these new tools, scientists have begun to unravel the mystery of sunspots. According to George Fisher, a solar astronomer at the University of California, "A sunspot is a dark part of the sun's surface that is cooler than the surrounding area. It turns out it is cooler because of a strong magnetic field there that inhibits the transport of heat via convective motion in the sun. The magnetic field is formed below the sun's surface, and extends out into the sun's corona."